As incoming college freshmen weigh the pros and cons of pledging a fraternity or sorority this fall or next spring, they should consider this: Being part of the Greek system may have benefits that reach far beyond their college years. A new Gallup survey, released Tuesday, of more than 30,000 college graduates across the U.S. finds that those who were members of fraternities or sororities are more likely to be "thriving" in their well-being and engaged at work than college graduates who did not go Greek. Gallup partnered with the National Panhellenic Conference and the North-American Interfraternity Conference to conduct this research. It is a subset of the initial Gallup-Purdue Index survey released last month, which studied the characteristics of the student experience that are most important to long-term outcomes for graduates. The report found that college graduates who had inspiring mentors and professors, who took part in long-term academic projects and extracurricular activities, and who had an internship or job where they applied what they learned are more likely to have higher well-being and work engagement later in life. The 16% of college graduates who were members of Greek organizations are more likely to report being emotionally supported and having experiential and deep learning activities while in college, all of which likely have contributed to their higher work engagement and well-being. Fraternity and sorority members' engagement advantage indicates that they are more likely to be intellectually and emotionally connected to their organizations and enthusiastic about their work. Overall, 43% of fraternity and sorority members who are employed full time for an employer are engaged in the workplace, compared with 38% of all other college graduates. Importantly, these differences are statistically significant after controlling for key demographic variables, including gender, race, ethnicity, and socioeconomic status. Additionally, fraternity and sorority members are more likely than all other college graduates to be thriving in each of the five elements of well-being (purpose, physical, social, financial, and community). 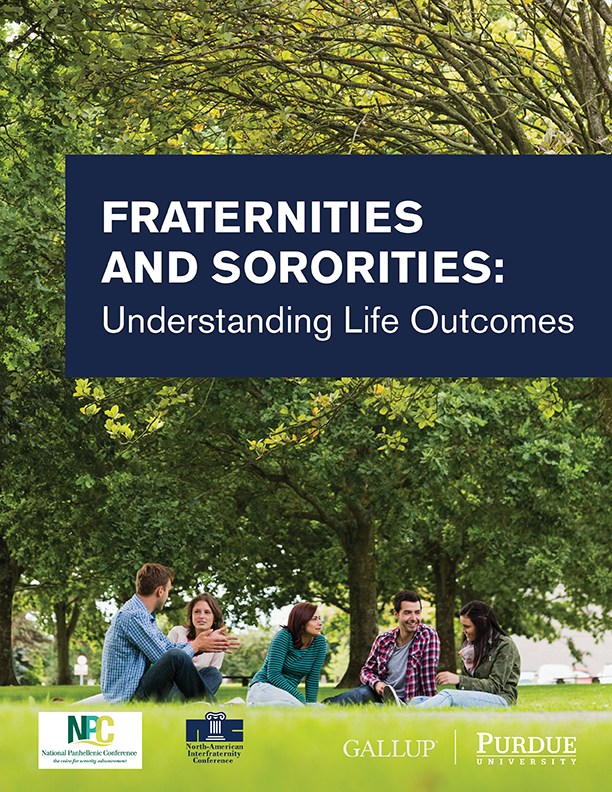 Thus, fraternity and sorority members are more likely than their non-Greek counterparts to find fulfillment in daily work and interactions, to have strong social relationships and access to the resources people need, to feel financially secure, to be physically healthy, and to take part in a true community. Individual Greek members and chapters have unfortunately been associated with issues involving hazing, binge drinking, and sexual assaults, and Greek organizations should certainly continue their efforts to prevent these negative events from happening. But it appears that, on the whole, the Greek experience has notable long-term benefits. Read the full report to learn more about these findings.